This is beautifully handcrafted porthole mirror with polish finish its 15" inch and 9.5" mirror sizes. 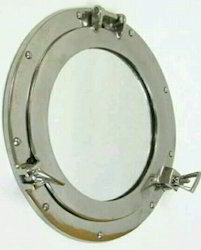 We offer a high quality Brass Porthole Mirror, nautical gift & decorative. 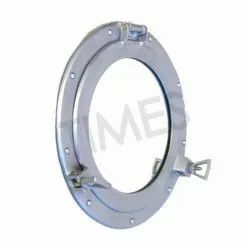 Being the foremost company, we are offering an exclusive array of Aluminium Round Nautical Porthole. Our offered array is famous for its attractive functions. This one is not only for nautical aficionados. An ageless solid brass mirror frame that will survive ages when treated properly. And it actually opens up. Easy to mount. Frame opens, but the view is the same opened or closed. These 12" Brass Nautical Porthole Mirror with aged patina. Porthole Mirror is in very good to excellent condition, with a beautiful patina. This piece has been prewired and ready to be hung. Please see our photos, there are two areas on the backside that have a discoloration to the brass. Porthole measures 12 inches. Available in Brass Finish, Antique Finish, Nickel Chrome Plated etc. nickel plated porthole mirror - 15"
solid brass nickel plated porthole mirror on painted black hardwood base. A very attractive piece for any up-scale nautical decor. measures 15" wide mirror is 10" wide.